In the mid-1970s, oil companies were being told oil was running out, prices were high and there was nothing they could do about it. The environmental movement from day one was full of horror stories about the oil industry and how it was ravaging whatever supposedly endangered acre or bug they could conjure up. 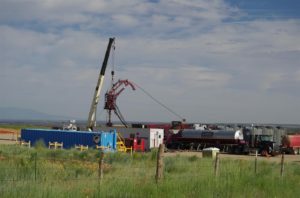 In the midst of that, Shell Oil, Mobil, and Mountain Fuel embarked upon a plan to develop a large known deposit of gas in Southwest Colorado. We know this as the McElmo Dome field now, and the gas? It was, of all things, carbon dioxide. The field would be over 200,000 acres, about 50% on federal land and the balance on private land. The federal area was managed by the BLM at the time. Idly picking up my father’s bible recently there was a newspaper clipping found within. It was an article out of the Denver Post with the date missing but from the comments was most likely either 1977 or 1978 as it references events to come about in 1978. 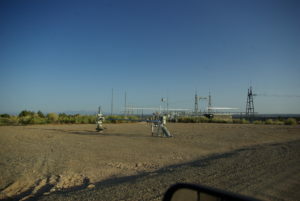 (In fact, I had worked for Mobil there in late 1977 on one of the test wells.) The title was “Fate of Fragile Archaeological Sites in BLM Hands”. The gist of the article was that allowing drilling on the area would completely destroy the archaeological features. The article claimed many of the sites along the canyon walls had never been visited by anyone but professional archaeologists. That is rather suspect as my father was raised on Goodman Point and lots of people hunted and gathered firewood in Sand Canyon and Yellow Jacket Canyon around “the point” that overlooked McElmo Canyon, the larger feature between Sleeping Ute Mountain and Goodman Point. As a child he and his cousins roamed those canyons hunting, gathering wood, and herding cattle. The article goes on to express the notion that these fragile sites the Anasazi abandoned a thousand years ago couldn’t survive the development of the field and apparently it ignored the fact the area had been drilled extensively before in search of oil. 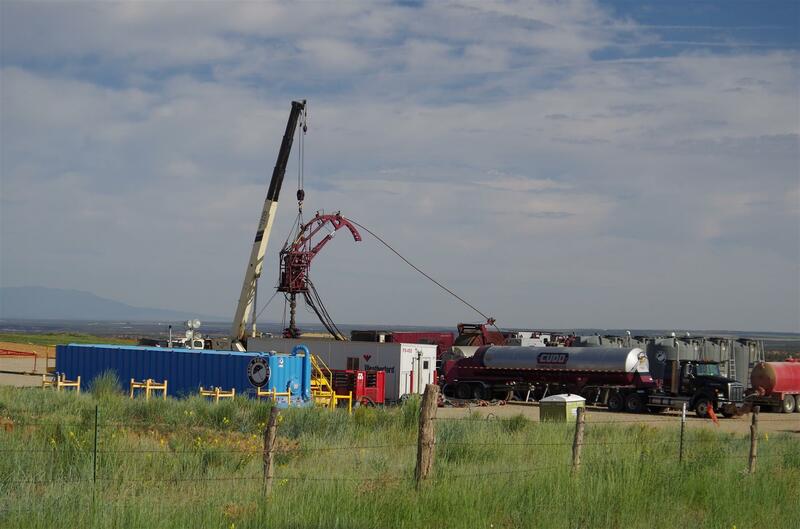 There were at the time, 13 producing wells that produced 508,000 barrels of oil and 99 MMCF of natural gas. There were also wells producing carbon dioxide which was made into dry ice. Nevertheless they argued that nameless vandalism and destruction would accompany the drilling and construction program. In other words, oil field trash would deliberately destroy these sites. Really? 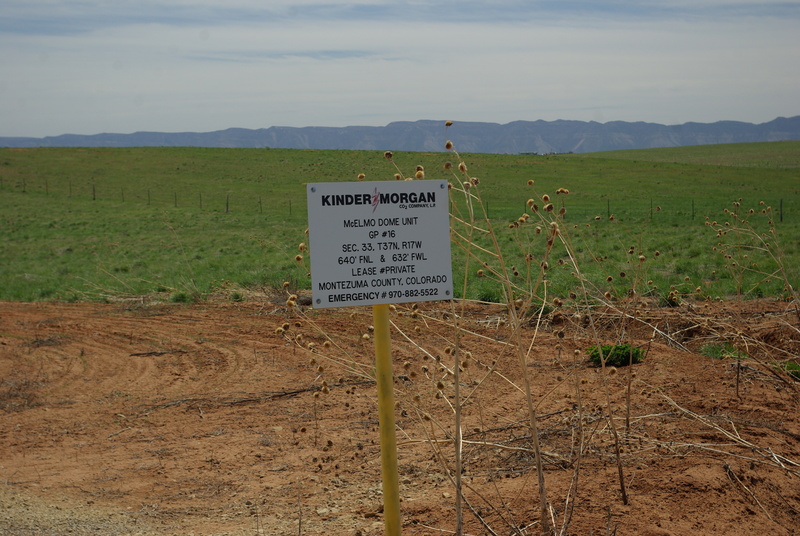 Meanwhile Shell sold out the operations to Kinder-Morgan who is primarily in the development and transportation end of the business. The carbon dioxide is sent to West Texas where it is injected into old oil fields where perhaps as little as 20% of the original oil was produced with primary and secondary (water flood) methods. This injection involves what is called tertiary recovery and can triple the original production by thinning the oil and repressuring the reservoir and then recycling the carbon dioxide as it is produced and thus maintaining the original formation pressures. It is a win-win for the environment. You can link here to the current development plan . Fast forward 20 years and Bill Clinton declared federal ground a wilderness, despite some oil development, oil leases, and substantial construction of radio towers, cell towers, etc. In doing so, the management of existing roads which were maintained by the county with financial help from the BLM, were in question. 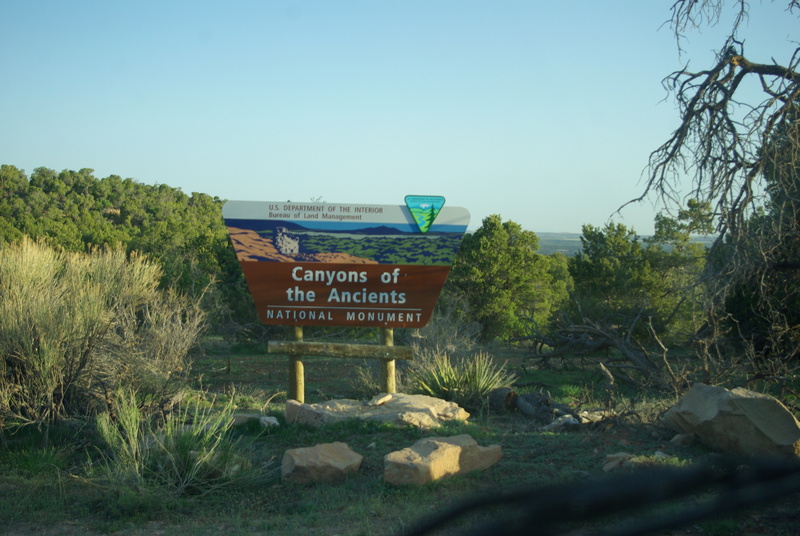 The new “Canyons of the Ancients National Monument”, was opposed by the local people, not by the oil companies. It meant that some ranchers could be landlocked behind the property, much of their property rights taken, perhaps even their mineral rights rendered nigh worthless. It also meant that locals had to go somewhere else to cut firewood. Since development the local people who used firewood to heat their houses went to the BLM and obtained wood cutting permits which allowed them to cut dead wood for heating. In any event, 175,000 acres was set aside. The worry of the county government was that the management of the site would be to switch from the BLM to the National Park Service which managed the Hovenweep site just north of the Canyons of the Ancients. This would end financial help maintaining public roads through the acreage, roads needed by those ranchers otherwise landlocked. The Park service had made it plain they didn’t have the budget to manage the new proposed Monument let alone help fund road maintenance. In the end, the BLM was given the task to manage the Canyons of the Ancients and the impact beyond preventing auto travel to places where it once had some older trails has been benign. So the BLM continues to support grading and maintenance of the existing county roads and you can still drive past unique sites like Moqui Lake, a usually dry pond that the natives used thousands of years ago. In the end, the oil industry has did no damage to the area despite causing nightmares in the minds of environmentalists. Neither has creation of the Canyons of the Ancients Monument impacted much of anything except firewood gathering. The leases for existing developments remain intact, although most certainly accompanied by more and more paperwork. But even in 1977 when I was working there, we had to shift the site slightly to avoid an old Kiva that lay buried in the brush somewhere. Further, most of the wells lie on private farmland where dry land pinto beans and alfalfa grown in 24″ rows are the staple crops. Fear of development was overblown in 1977, fear of the Monument was overblown in 2000. Much ado about nothing. But would they have been allowed to produce carbon dioxide in this current anti-CO2 environment? I wonder. But 42 years later, the archaeological sites were probably helped by the oil development. 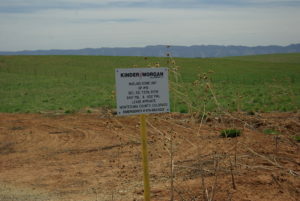 Crow Canyon (www.crowcanyon.org), a “living classroom” for archaeology fans and professionals, was founded about the same time as Shell was exploring on Goodman Point. Perhaps the publicity from development and the Monument has encouraged some serious looking at the history of the Anasazi which was much neglected in this region. As a departed cousin who lived in the area said, “Some of the old sites high on the canyon walls have collapsed since I first saw them in the 1930s.” That isn’t vandalism. That is simply the ravages of time.